Visit Devon's beautiful coastline and scenic countryside for an enjoyable pet friendly holiday with your dog. 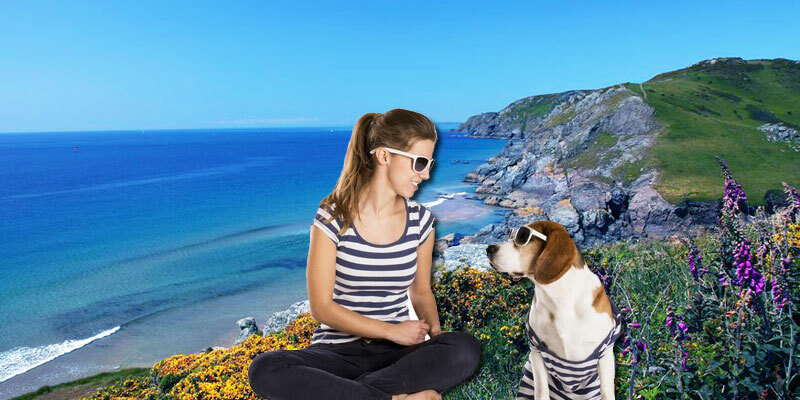 LovetoEscape offer a selection of great dog friendly cottages in Devon. Devon is well loved for its great surf and golden sandy beaches offering two coastlines to discover. Both North Devon and South Devon's coast feature fantastic dog friendly beaches all year round. Inland Devon is largely rural providing plenty of lovely country walks. Dartmoor National Park situated in the centre of the county, offers miles of scenic moorland and circular walking paths. In North Devon, the Exmoor National Park, borders with Somerset and takes in unspoilt countryside and spectacular coastal scenery. There are over 30 miles of paths available to walkers and cyclists using the old railways of North Devon, known as the Tarka Trail. Many of these walks have easy access and are suitable for use by cyclists, wheelchairs and pushchairs. Torridge Estuary Rail Trail follows the Tarka Trail between Instow and Bideford. Since the route uses a former railway, it is an easier walk but takes in stunning countryside and panoramic views of the Torridge Estuary. The Promenade at Instow offers a superb view of the estuary where it meets the River Taw. The South West Coast Path features over 630 miles of the stunning Cornish and Devon coastlines so there is plenty of great walking. Throughout the region, there is a great range of walks to suit easy access to more challenging terrain, including coastal settings, former railways, woodland walks and designated pub walks. Pet friendly holidays in Devon are great as many of the visitor attractions in the region will welcome dogs. The South Devon Railway allows dogs on board and takes in the scenic route through the River Dart Valley, between Buckfastleigh and Totnes. Many pubs in Devon will welcome dogs, allowing you to enjoy a pint of local ale or cider following your day’s walking. Escape with your dog and enjoy beautiful Devon and the West Country. The best thing about staying in a holiday cottage in Devon is that you can bring your dog with you. Not all of the self catering cottages that we offer will accept dogs. However, we try to encourage our accommodation owners whose properties are located in good walking country to welcome dogs. We have a great range of dog friendly holiday cottages in Devon. If you are looking for a pet friendly cottage elsewhere in the UK or Ireland, we have a great range of pet friendly cottages.